This disease is caused by a virus related to measles and affects the respiratory, gastrointestinal, and central nervous systems. It is a highly contagious illness, and is transmitted via airborne droplets from infected dogs. Symptoms may include a fever, runny nose, watery eyes, and can progress to twitching muscles, paralysis, and seizures. Treatment includes supportive fluid therapy, and antibiotics for secondary infections. Vaccination is recommended for all dogs for this potentially fatal disease. This is a viral disease that can damage the liver, kidneys, spleen, and lungs. Dogs that recover from the virus continue to shed virus in their urine for at least six months. 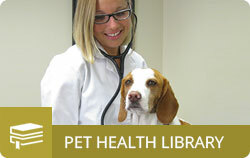 The virus is transmitted through the ingestion of urine, feces, or saliva of infected dogs. Symptoms include a fever, runny nose and eyes, vomiting, bleeding, and respiratory disease. Treatment is supportive fluid therapy, antibiotics for secondary infections, and possibly blood transfusions. The mortality rate is very high in young dogs. This vaccination (CAV-2) is recommended for all dogs. This is a viral disease of the gastrointestinal tract. Puppies are at greatest risk, and the virus is resistant to many disinfectants. Transmission occurs through contact with infected dogs or their feces. Symptoms can include bloody diarrhea, fever, and lethargy. Treatment consists of fluid therapy, antibiotics, and supportive care. 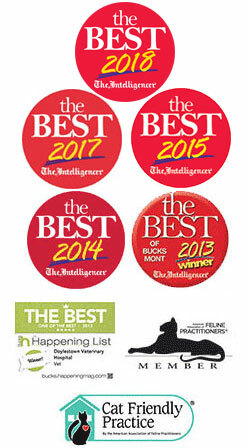 Most dogs recover with appropriate supportive care. Vaccination is recommended for all dogs. Rabies is an acute viral disease of the nervous system that can affect any mammal. The virus is almost always transmitted via the bite of an infected animal (such as a skunk, racoon, or bat). Symptoms can be variable and include sudden changes in behavior (fear, aggression, irritability), lethargy, inappetance, and signs related to nervous system disease such as weakness or paralysis. Any unvaccinated animal that is exposed to rabies should be euthanized or strictly quarrantined following state law. The prognosis is always fatal once clinical signs appear. 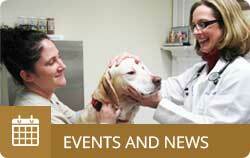 Vaccination is recommended for all dogs, and mandated by law in Pennsylvania. This bacteria is often the primary organism contributing to infectious tracheobronchitis, an inflammation of the upper airways commonly called kennel cough. This disease is highly contagious, and is transmitted by airborne droplets from infected dogs. Symptoms include a harsh, dry couch, often followed by retching and gagging. Treatment is aimed at supportive care, and sometimes cough suppressants. The prognosis is usually very good, but this disease can progress to pneumonia in puppies or chronic bronchitis in older dogs. This vaccination is recommended for all puppies, and then annually for dogs in close contact with other dogs (such as occurs in boarding, grooming, daycare, dog parks, or training situations). This is often the primary virus contributing to infectious tracheobronchitis, an inflammation of the upper airways commonly called kennel cough. This disease is highly contagious, and is transmitted by airborne droplets from infected dogs. Symptoms include a harsh, dry couch, often followed by retching and gagging. Treatment is aimed at supportive care, and sometimes cough suppressants. The prognosis is usually very good, but this disease can progress to pneumonia in puppies or chronic bronchitis in older dogs. This vaccination is recommended for all puppies, and then annually for dogs in close contact with other dogs (such as occurs in boarding, grooming, daycare, dog parks, or training situations). This is a bacterial disease that can affect the liver, kidneys, and other organs. Transmission occurs through contact with urine from an infected dog. Symptoms in the early stages of the disease include fever, lethargy, loss of appetite, and joint and muscle pain. Treatment is fluid therapy and antibiotics, but acute renal failure occurs in 80% to 90% of dogs with clinically significant disease. Vaccination is recommended for all dogs older than 12 weeks of age in areas where this disease is prevelant. Lyme disease is caused by the bacteria Borrelia burgdorferi and is transmitted through the bite of infected ticks. Symptoms can include fever, lameness, lethargy, and lack of appetite. Treatment is antibiotics and sometimes antiinflammatory drugs. Infection can sometimes persist despite treatment. Vaccination is recommended for all dogs in areas where disease is present, and prevention strategies should include the yearround use of topical tick control agents. Southeastern Pennsylvania has one of the highest rates of Lyme disease in the United States. This virus causes almost half of all upper respiratory disease in cats, and can be transmitted by an infected animal coughing and sneezing, or by contaminated objects (fomites). Symptoms include sneezing, a runny nose, watery eyes, and a fever. Treatment usually involves supprtive care and may include antibiotics for secondary infections. Most affected cats recover, although the prognosis can be more guarded for very young kittens and geriatric cats. Some affected cats will have chronic relapses of the virus. Vaccination is recommended for all cats. This virus is a major cause of upper respiratory infections, and is sometimes a co-infecting agent with feline viral rhinotracheitis. It is highly contagious and is spread by airborne droplets from an infected cat, or by a contaminated object. Symptoms can include oral ulcers, limping, drooling, sneezing, fever, and pneumonia. Treatment is aimed at preventing secondary bacterial infections, and the prognosis is good for most cats. Vaccination is recommended for all cats. This virus destroys white blood cells in bone marrow, lymph tissue, intestines, and the brain. It is highly contagious, and is spread through the saliva, mucus, and other secretions of infected cats. Symptoms include a high fever, vomiting, and dehydration. Affected cats are usually treated with fluid therapy and supportive nursing care. This virus has a high mortality rate in kittens, and vaccination is recommended for all cats. Rabies is an acute viral disease of the nervous system that can affect any mammal. The virus is almost always transmitted via the bite of an infected animal (such as a skunk, racoon, or bat). Symptoms can be variable and include sudden changes in behavior (fear, aggression, irritability), lethargy, inappetance, and signs related to nervous system disease such as weakness or paralysis. Any unvaccinated animal that is exposed to rabies should be euthanized or strictly quarrantined following state law. The prognosis is always fatal once clinical signs appear. Vaccination is recommended for all cats, and mandated by law in Pennsylvania. This retrovirus can cause a variety of disease symptoms, including anemia and malignant tumors. It also weakens the immune system, causing cats to be vunerable to other diseases. In the early stages infected cats may be asymptomatic. The virus is transmitted in the saliva, usually by bite wounds, and young kittens are especially susceptible. Treatment is supportive, and is usually not effective. Infected cats can survive for years if they do not develop secondary diseases or cancer, and cats in this state should be isolated from healthy cats. Vaccination is recommended for all kittens, and for adult cats that are exposed to other cats – in shelters, breeding facilities, or by going outside. Serious but rare side effects, such as severe allergic reactions, may occur in minutes to hours after a vaccine. Signs can include vomiting, diarrhea, itchy skin, difficulty breathing, facial swelling, and collapse. These signs can be a medical emergency. Please contact Doylestown Veterinary Hospital or, if after hours, an emergency veterinary facility, as your pet may require immediate medical attention. Just like humans get colds and flu, dogs can too. However, most pet parents are not familiar with infectious canine tracheobronchitis, previously referred to as “Kennel Cough,” more accurately known as “Canine Cough.” Canine Cough is a general term used to describe a highly contagious cough caused by one of several infectious agents and can be either viral or bacterial. The most common cause is a bacterium called Bordetella bronchiseptica. If you give your dog the Bordetella vaccine it will be protected from the particular strains in the vaccine itself, but not necessarily from all contagious coughs. There are several things we can’t vaccinate for that can cause the same contagious cough symptoms. Canine Cough is found worldwide and will infect a high percentage of dogs during their lifetime. It can spread anywhere dogs come into contact with each other….the dog park, group training classes, the vet’s office, play time at a friend’s house, or even at a quality pet care facility. The price of socialization – which is essential to the well-being of your dog – is possible exposure to disease. A good doggy daycare or pet care facility will take all possible steps to minimize the spread of Canine Cough and other illnesses. Make sure the facility you select requires current vaccinations, including the Bordetella vaccine. 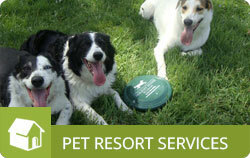 Ask about cleaning protocols for areas in which dogs congregate, and for toys and leashes that are shared. Take a tour and make sure there is plenty of fresh air circulation and that employees are cleaning their hands frequently. 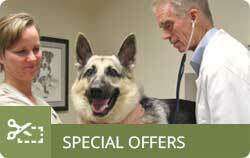 All pet care facilities, doggy daycares, grooming salons and veterinary hospitals deal with Canine Cough. Like humans with a cold, dogs can be contagious and spread the illness to others before showing any signs of being sick. This makes it very difficult for pet care professionals and pet parents to identify asymptomatic dogs with Canine Cough. If your dog shows symptoms of Canine Cough, such as sneezing, nasal discharge, or a deep cough, be sure to seek care from your veterinarian. For most dogs the illness lasts from seven to ten days and is often simply a nuisance. Treatment may involve antibiotics, a cough suppressant or TLC at home, depending on your dog’s symptoms. If your dog develops a cough, it is important to keep him or her at home and away from other dogs for several days until all signs of illness are gone. The good news is that for otherwise healthy dogs with normal immune systems, regular exposure to other dogs may help to build immunity to several of the strains of Canine Cough.